Spirit Halloween Fortnite Rainbow Smash Pickaxe | What Should I Say? Spirit Halloween Fortnite Rainbow Smash Pickaxe by Spirit Halloween at What Should I Say?. Hurry! Limited time offer. Offer valid only while supplies last. Turn Halloween from dark and scary to sunshine and rainbows when you add this officially licensed Fortnite Rainbow Smash pickaxe to your costume. 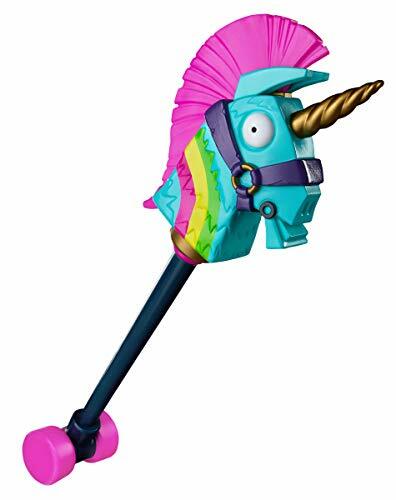 Turn Halloween from dark and scary to sunshine and rainbows when you add this officially licensed Fortnite Rainbow Smash pickaxe to your costume. This colorful accessory features a blue llama unicorn hybrid on the front with a signature pink Mohawk-embellished unicorn horn, and rainbow pattern on its face. To top it off, its movable, working wheels add a realistic touch. Gather your materials in colorful style when you add the Rainbow Smash pickaxe to your epic Fortnite Halloween costume. Bring on the sunshine and rainbows this Halloween when you have this officially licensed Rainbow Smash pickaxe! This awesome Fortnite pickaxe will perfectly complete your costume just in time for Halloween! If you have any questions about this product by Spirit Halloween, contact us by completing and submitting the form below. If you are looking for a specif part number, please include it with your message.